On October 1, 2014, the suspension bridge which crosses the Athabasca River in Jasper National Park, along the land access route to Hamber Park, failed. Fording the Athabasca River is not recommended. There is no estimated time for repair or replacement of this bridge. Hamber Park is a remote wilderness area with few facilities. Over the past few years, BC Parks has been rehabilitating impacts of the past use at Fortress Lake. There is now a rustic campground and toilet at the east end of the lake and an air-accessed commercial fishing camp on Chisel Creek Fan (midway down the lake’s south shore). There are no other developed facilities, but several traditional campsites are identifiable along the north shore. An old trail to access these sites is in the process of being re-opened from the east end. At present, the easiest access to lake shore features is by renting a boat from the fishing camp. No other trails exist, but midway along the north shore Washout Creek provides a steep, rugged, but relatively open access to scenic alpine tarns. Hamber Provincial Park comprises a portion of one of the world’s largest blocks of protected areas. 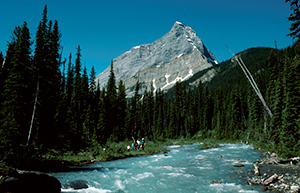 The park was designated as part of the Canadian Rocky Mountains World Heritage Site by UNESCO. If you visit Hamber, we request you conduct yourself in a manner that is compatible with a wilderness park. Weather in Hamber varies depending on the season. Almost half of the days during the summer have rain and wind, so hikers should come prepared for these conditions. Campfires are permitted in the park, but light-weight stoves are recommended for cooking. Vehicles may be left in the Sunwapta Falls parking lot in Jasper National Park, but require registration with Parks Canada. In the winter season, you can ski or snowshoe 22 flat kilometres into Fortress Lake to ice fish (no snowmobiling or ATVs are allowed). Bring your own drinking water or be prepared to boil or filter water, as potable water is not available in the park. Windfalls are common and blow-down of large trees is a significant hazard during high winds. Hikers must cross the Chaba River. The river crossing can be dangerous. Please use caution – all stream crossings can be treacherous at times, depending on seasonal daily run-off fluctuations. Bear Country precautions are essential with respect to travel, camping, and storage; grizzly and black bear habitats are extensive throughout the park. Bear poles are available at the campsites. The park is located 22 km from the trail head parking lot at Sunwapta Falls (Jasper National Park) to the campground at the east of Fortress Lake. The closest communities, towns and cities are Valemount and Jasper, Alberta. History: Hamber Provincial Park was named to honour the late Eric W. Hamber, the distinguished lieutenant-governor of B.C. from 1936-1941. With improved access in recent years, the park now sees 400-500 visitors annually. Conservation: Vegetation around the lake is thick with spruce and balsam with a very heavy understory of false azalea and rhododendron. The management plan for Hamber Park was approved in October 2015. Visitors are in the Canadian Rocky Mountains. Climbers should check with Parks Canada and Mount Robson Provincial Park for information on climbing in the area. Fortress Lake, home to brook trout, offers excellent angling opportunities. There is an air-accessed commercial fishing camp on Chisel Creek Fan (midway down the lake’s south shore). Fortress Lake is open for ice fishing in the winter season, but is a long way in to travel to fish. Anyone fishing or angling in British Columbia must have an appropriate licence. An old trail accessing the campsites on the north shore of the lake is open for hikers’ use. No other trails exist but, midway along the north shore of Fortress Lake, Washout Creek provides steep, rugged, but relatively open access to scenic alpine areas. From Sunwapta in Jasper National Park, a 22 kilometer trail leads to Fortress Lake in Hamber Provincial Park. This trail crosses both the Athabasca and Chaba Rivers though no bridges are provided. Fording the Athabasca River is not recommended. For your own safety and the preservation of the park, obey posted signs and keep to designated trails. Shortcutting trails destroys plant life and soil structure. There are backcountry skiing and snowshoeing opportunities in the park. There are no defined trails and is remote winter travel. There is track-setting Jasper National Park and Valemount nearby. At the Chisel Creek end of Fortress Lake there is the Fortress Lake Lodge. They are available during the summer months starting June 1st and can hold 12 people at a time. There is a fee for using the lodge and you can reserve by contacting the Fortress Lake Lodge. Campfires are permitted in the park, but lightweight stoves are recommended for cooking. Please be extremely careful with fires and only use down and dead wood. A rustic campground is located at the east end of Fortress Lake and several traditional campsites are identifiable along the north shore of the lake. Each campsite has a pit toilet and bear pole for storing food. Visitors may camp during the winter season but be prepared for conditions.